This book examines a critical period in the violent history of “The Troubles”. Wharton’s book covers every single murder, attack and tragedy of this period in painstaking, forensic detail. Irish Republicanism, like its bloodthirsty Loyalist equivalent, bred and nurtured men of evil; psychopathic men and women who killed without compunction or thought; men and women who thought nothing of robbing innocents of their lives, uncaring of the devastation their actions would inflict on wives and children and parents alike. Yet at the same time, some complain about a ‘shoot-to-kill’ policy, ignoring civil rights and the so-called rule of law. These same concepts were conveniently overlooked by the terrorists of the IRA/INLA and the rest. One is constantly in conflict with the armchair IRA supporters of modern Irish Republicanism who talk of ‘oppression’ and ‘the struggle for freedom.’ But rest assured that whilst there is breath in this author’s body, the battle to prevent Gerry Adams and the rest from re-writing history to suit their devious ends will never cease. 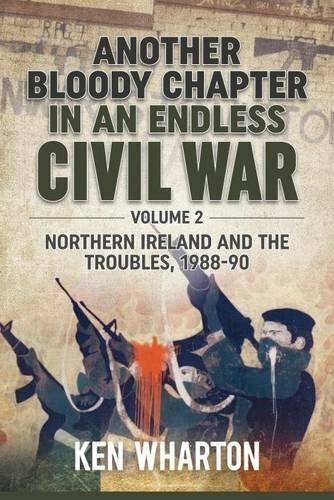 This book picks up from where Volume 1 left off and describes and analyses the major incidents and stories from the Troubles between the years 1988 and 1990, as Operation Banner continued and Irish Republicanism and Northern Irish Loyalism continued to make the country into a bloody battlefield, where, quite literally, no-one was safe and where violence touched virtually every household in Ulster.